Whether you accept dairy as a reasonable Paleo compromise food or avoid it as a neolithic invention, one thing is undeniable: dairy gets pushed very, very hard as the #1 calcium food around. (If you want to know why that is, look no further than the dairy industry’s lobbying budget – dairy has been buying its way into the US Dietary Guidelines for years now.) But think about it for even a few seconds and that starts sounding really silly. Almost all people whose ancestors lived in east Asia are lactose intolerant – there was no tradition of eating dairy in Asia until very recently. And they all still had bones! Dairy farming only appeared for the first time about 7,000 years ago and there have been humans on Earth for the last 2 million years (that’s 2,000,000). So for 1,993,000 years (give or take) we somehow made it without dairy foods as a regular part of our diet. Obviously, humans don’t need dairy to get enough calcium. Not actually necessary to prevent osteoporosis! We’ve already gone through a comprehensive look at non-dairy calcium sources, including the different absorbability of different sources (that’s here if you want to look at it). But here’s the quick version: 5 dairy-free meals with as more calcium than a single-serving yogurt cup. A typical single-serving yogurt is between 5 and 6 ounces, so we’ll call it 5.5 just to take the average. 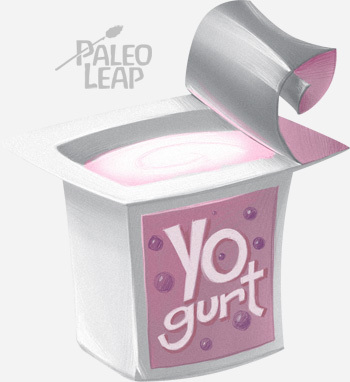 According to the USDA nutrition database, 5.5 ounces of low-fat yogurt has 275 mg of calcium in it – and that’s if it’s all yogurt and not half strawberry Jell-O or Oreo cookie crumbles or granola or whatever they’re even putting in them these days (no seriously, walk by the yogurt aisle and the candy aisle – it’s the same stuff). But let’s be generous and assume it’s plain yogurt. To get 275 mg of calcium, check out what you could eat instead (all numbers are from the USDA nutrition database). As long as you get bone-in sardines, every can of sardines is a little calcium bomb in a conveniently delicious package. In fact, you’d be good even without the broccoli. You could throw the sardines over salad greens or eat them with any other random vegetable and still have more calcium just in a can of sardines than in a yogurt cup. But roasted broccoli with plenty of olive oil and garlic is delicious with sardines, so why not? Collards: a surprising superstar of the vegetable calcium sources. Collards actually have the most calcium of any green vegetable. And they’re cheap! You can get a huge bag for $2 or $3 already pre-cut and everything. Note: the collards don’t have to be braised. You can cook them however you like. Calcium isn’t destroyed by heat, so there’s no need to be particular about cooking methods here. Make a classy salmon salad with some avocado in it – like this one – and serve some asparagus on the side. Just like with the sardines, make sure to get bone-in salmon (the calcium is in the bones, not the flesh of the fish). Again, the asparagus doesn’t have to be grilled. Cook it however you want. An easy way to cook the greens is to just load them all onto a baking sheet, drizzle with olive oil (or your cooking fat of choice – lard is delicious with kale), and pop in the oven until they wilt. Take them out, sprinkle with salt/pepper/red pepper flakes/chili powder/whatever you want, and enjoy! 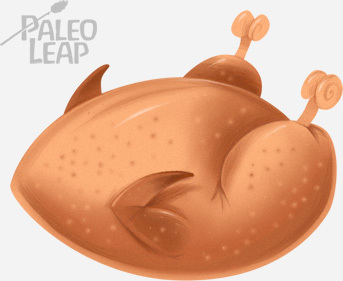 Bonus: gnaw off the ends of the chicken wings. 1 chicken wingtip = 1,000 mg calcium. Bones are an incredibly concentrated source of calcium. An amount of bone the weight of a penny has around 1,000 mg of calcium in it! (you can see the math for this here.) If you occasionally nibble off the wingtips (or the tips of your drumsticks, or any other soft and easily-chewed bones), you’ll be beyond set for calcium. Did you know that sesame seeds actually have quite a bit of calcium? And shrimp aren’t exactly slouching in that department, either. Sesame-crusted shrimp would be really fun to dip in some homemade Paleo cocktail sauce. Not a shrimp fan? Try sesame-crusted tuna instead and maybe throw in a few greens to make up for the missing shrimp. Dairy is Nice, but it’s Not Necessary. Some people do fine with dairy; other people don’t. If dairy sits well with you, then full-fat dairy is probably the best choice and there’s nothing wrong with enjoying it, even though technically it wasn’t around in the Paleolithic. On the other hand, if you’re in the latter group, no need to worry. 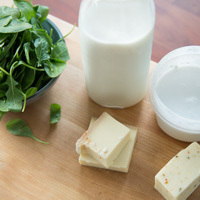 A dairy-free diet is not a one-way ticket to osteoporosis. Read up on all the factors that affect bone health (it’s not just calcium!) and take advantage of the colder weather to dive into the huge variety of winter cooking greens. And if you’re looking for something to put in your coffee, check out some delicious Paleo dairy substitutes here.